Ice Cream Show Will Premier in Mumbai for the 1st time where in 100 different flavours,shapes,sizes and varities of Ice Cream will be available . Home Made Ice Cream , Vegan Ice Creams , Pet Ice Creams , Nitro Ice Creams , Alcohol Ice Creams , Special Hand Made Ice Creams will be served to visitors . Along with this we will be having Dedicated Kids Area where in they can take part in various activities. Adding to the show is Some Good Music, Food and Chilled Beer will make ur weekend and summer vacation amazing . 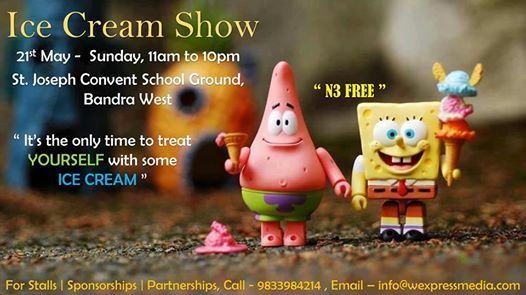 Lets beat the heat by having our favourite Ice Cream at the Show. Dont forget the Entry is Free - " N3 FREE "
For any enquiries call Niraj - 9833984214 or Email - info@wexpressmedia.com.